How fun are these Leprechaun Nutter Butters Cookies? I mean, I cannot get over the adorable detail on their little faces! Almost too cute to eat. Just kidding. You know my kids are going to gobble them right up and I will be right alongside with them. As a Sweeney, St. Patrick’s Day is kind of a big deal. We try to make it to the NYC St. Patrick’s Day Parade as often as we can. We rush over to Grandma’s house for some delicious homecooked Irish Soda Bread and pray that she’s made a few extra loaves for us to take home and we come up with fun desserts for our children to enjoy. With Nutter Butter cookies, the shape is already taken care of for you. Truly, I didn’t even call it a recipe because it’s more of a decorating post than it is a cooking post. We are going to be melting and showing off our artistic abilities with details – not measurements and mixtures. Using a double boiler, melt the orange candy melt. Once the orange candy melt starts to break down, add in about 3-4 tbsp of coconut oil and mix until smooth. Once melted, take a Nutter Butters cookies and dip one side of the cookie into the candy melt. Carefully shake the Nutter Butters cookies to get rid of excess chocolate. Then turn the Nutter Butters cookies so that you can dip the other side of the Nutter Butters. Once both sides are dipped, dip the bottom of the cookie into the orange chocolate. 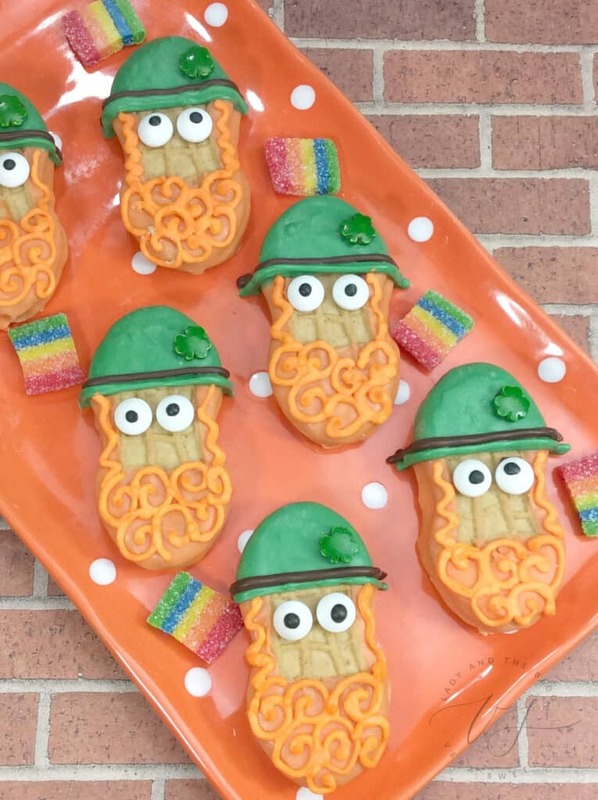 This will create the beard of the leprechaun. 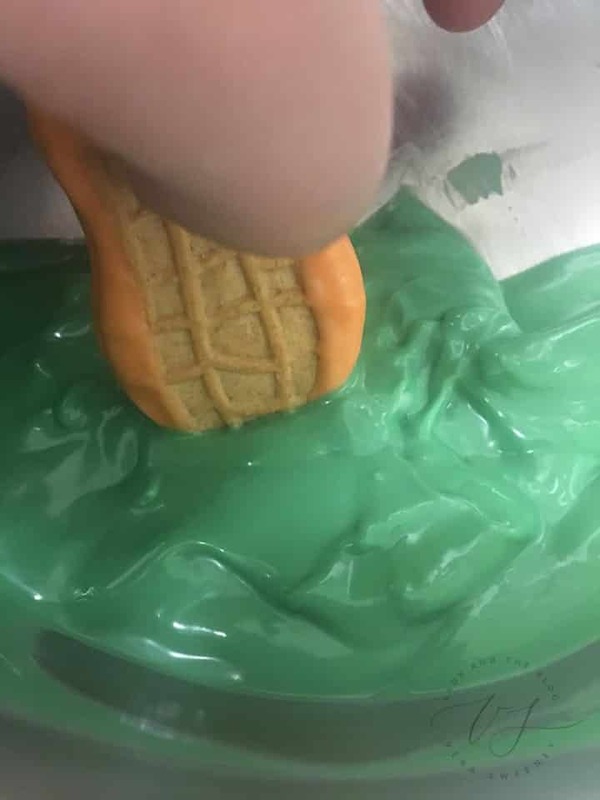 Carefully shake the Nutter Butters cookies to get rid of any excess candy melt. Place Nutter Butters cookies onto the cookie sheet and repeat steps with remaining cookies. 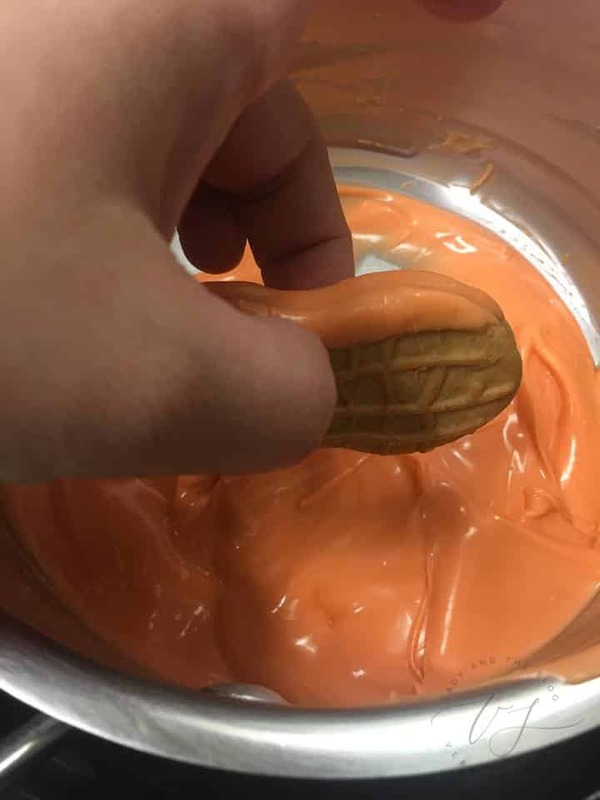 Allow the orange candy melt to completely dry on the Nutter Butters before starting to work on the hat. While you are waiting, scoop some of the orange candy melt into a piping bag and set aside. While the cookies are drying, melt the green candy melts. Add in 3-4 tbsp of coconut oil into the green candy melt to thin it out. 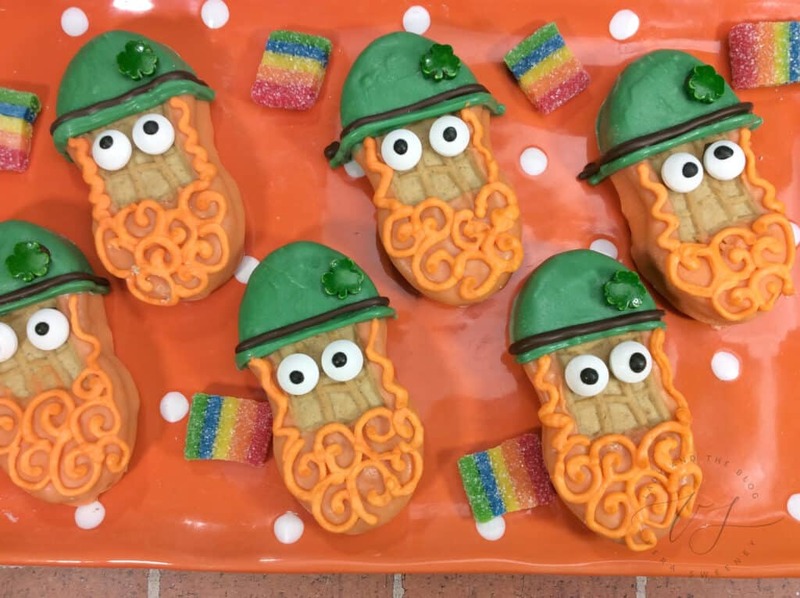 Once the cookies have hardened, dip the other end into the green candy melt to create the hat. Now that you are hearing it broken down this way, it seems easier right? This really isn’t difficult. It just takes a few steps to get through it all. Lightly shake the cookies to get rid of the excess candy melt. Scoop some green candy melt into a piping bag and set aside. Add a small dollop of candy melt onto the back of the edible eyes to act as glue. Place the eyes onto the cookies. In a small microwave-safe bowl, melt a few of the black candy melts in intervals of 30-45 seconds until completely melted. Mix in 1 tbsp of coconut oil to help thin out the candy melt. Scoop into a piping bag and set aside. Cut the tip off the green piping bag and pipe a line on the bottom of the green part of the Nutter Butters. Cut the tip off the black piping bag and pipe a line next to the green line. Add a small dot of black candy melt onto the back of the shamrock sprinkle and place in the top right corner of the hat. 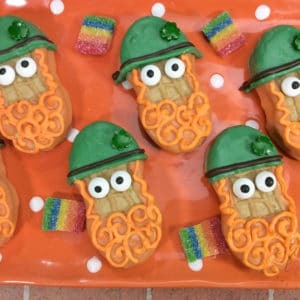 Cut a small tip off the orange candy melt piping bag and pipe on swirls onto the beard on the Nutter Butters. Super fun! 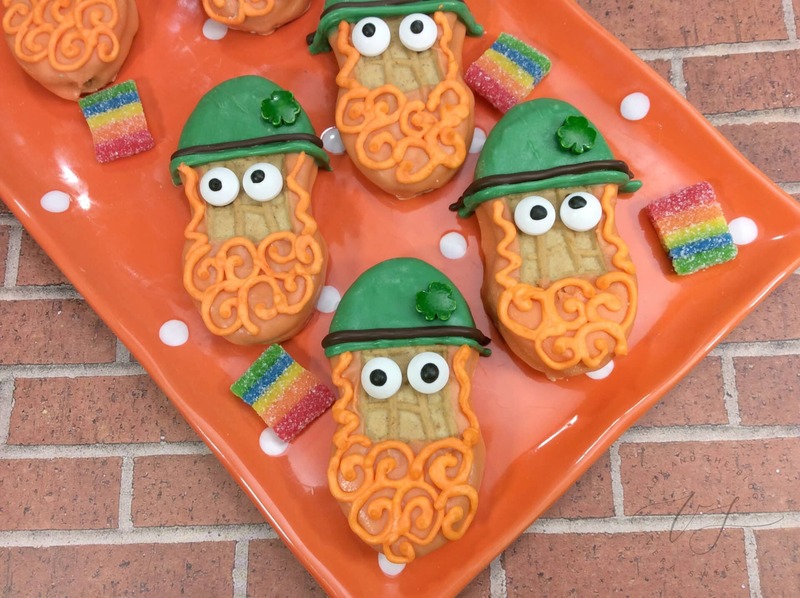 These Leprechaun Nutter Butters Cookies are great treats to bring to school! I am sure that your son or daughter’s class would get a KICK out of these cookies. I mean, I can’t stop looking at the final results. Totally adorable and just perfect for the holiday. 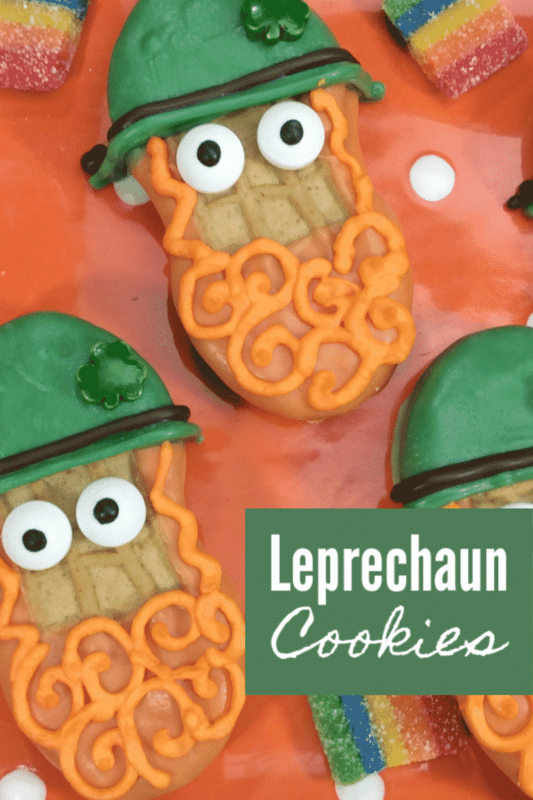 The perfect St. Patrick’s Day dessert idea for sure. Once melted, take a nutterbutter and dip one side of the cookie into the candy melt. Carefully turn the nutterbutter so that you can dip the other side of the nutterbutter.